Senator Flamininus will stop at nothing to conquer Macedon and Greece, but Philip V is determined to restore his kingdom to its former glory. Based on real historical events. 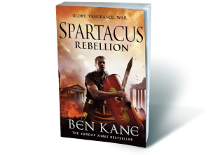 When Lucius Tullus gambles on a foot race between rival legionaries, he has no idea that his wager will endanger his very life. Close to the Rhine, Lucius Tullus prepares to take his soldiers on patrol. But German tribesmen prepare a deadly ambush. 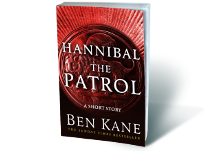 As Legionary Marcus Piso enjoys a four monthly payday with his comrades, events take on a very dangerous life of their own. 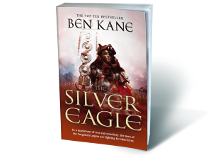 The eagle belonging to Tullus’ old legion is still in enemy hands, but as the Romans’ reprisals take them deep into German tribal lands, he remains convinced that it is within reach. Defeated German chieftan, Arminius, is burning for revenge. Charismatic as ever, he raises another large tribal army, which will harry the Romans the length and breadth of the land. Tracing one of the most bitter wars in ancient times – through the eyes of those on both sides. 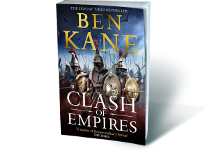 As the Second Punic War looms, the lives of four young people – two Carthaginian, two Roman – are entwined, for good or ill.
Set just before the opening of Fields of Blood, this short story is about danger, treachery, loyalty – and death. 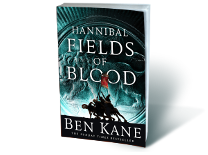 Continuing the stories of the characters in the first Hannibal novel, Fields of Blood ends with the incredible battle of Cannae. 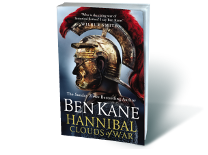 As Rome’s war with Carthage continues, two friends confront each other in one of the most brutal sieges of all time. This is the story of one of the most famous figures in world history. 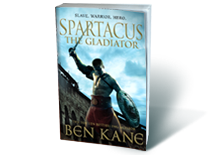 Read the gripping, bloody and savage story of Spartacus – one of the most famous and enduring heroes in world history. Who can stop Spartacus and his slave army now, in their triumphant march towards the Alps and freedom? 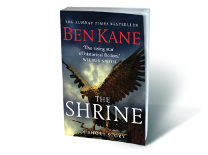 A gritty portrayal of first century BC Rome in all its grandeur – and filth. Rip-roaring action about slaves, gladiators and brothels. 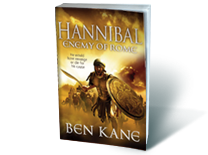 Follow Crassus on his doomed march into the East and discover his legions’ fate. 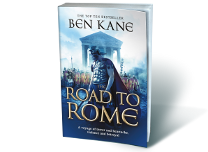 In the second part of the trilogy Fabiola plots and schemes in Rome, while Romulus and his friends battle for survival at the edge of the known world. 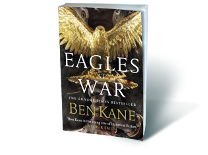 The trilogy comes to a stunning conclusion against the dramatic backdrop of the civil war and Caesar’s rise to power. It’s always interesting to find out where writers get their ideas from. Some find it when they’re researching a time period, or watching a TV programme. Others find their muse when they’re driving, or listening to music, or just walking their dogs. I’m not sure that I have a set method for doing it. The seeds of The Forgotten Legion trilogy come partly from a trip I took in 1998, along part of the ancient Silk Road that stretches from the Mediterranean coast of Syria & Lebanon all the way to China. I had spontaneously decided on the trip after reading The Lost Heart of Asia, an amazing travelogue by the acclaimed writer Colin Thubron. Armed with 9 months worth of once a week night-class Russian, over $3,000 in cash (there were no ATMs where I was going; traveller’s cheques weren’t accepted either) and a dollop of intrepidation, I flew to Tehran in May 1998. After ten days in Iran, I was in love with the country. Even now, having visited more than 65 countries, I can honestly say that the Iranians were the most friendly people I have ever met (they’re joint first with the Pakistanis). I visited some of the most incredible places, such as the palaces and huge courtyard in Esfahan, the teeming Tehran markets and best of all, Persepolis, former capital of the Persian empire until Alexander the Great sacked it in the 32os BC. There, amid the huge columns that were still lying where they had fallen more than two millennia before, I was the only tourist. What better way to give a sense of atmosphere?! But it was in Turmenistan, former Soviet Socialist Republic and newly independent state, that I stumbled upon the place that would feature in The Forgotten Legion trilogy nearly a decade later. In the Turkmen desert lie the ruins of a city called Merv, which was sacked by the Mongols in the 1220s AD. At the time, it was home to more than a million people; it was a metropolis that dwarfed every other city not just in Europe, but the world. When the Mongols took it, they killed every man, woman and child they could find. Then they rode away for 3 days, and came back, slaughtering all those who had come out of hiding. It was the largest number of people killed in one place until the atrocities committed in the 20th century. That horrifying statistic hammering into my brain like the burning sun, I wandered around the site in temperatures exceeding 45 C. I suffered sunstroke for the only time in my life, which is possibly why I didn’t really believe the line in my guidebook which said that the city had previously been known as Antiochia, and had been founded by Alexander the Great. Furthermore, the city had seen the arrival in 53 BC of thousands of Roman soldiers. So far from the Mediterranean, so far from Syria and Judaea? I thought. No way. Yet when I did a little research upon my return, I discovered this to be true: that after the battle of Carrhae, in which Marcus Licinius Crassus had lost his life, 10,000 legionaries were marched east to Margiana (Turkmenistan) by the Parthians, there to serve as border guards. Of course I forgot all about this gem of an idea for many years. 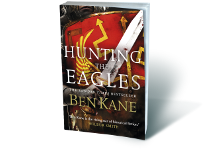 It was only when I had been signed by a literary agent in 2006, and had been told in no uncertain terms that my first novel, set in 2nd C. AD Britain (on Hadrian’s Wall, no less – at the same time as Wounds of Honour by Anthony Riches! 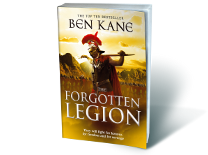 ), did not quite make the grade, that I revisited the story of the forgotten legions. I am very glad that I did, because the rest, as they say, is history! 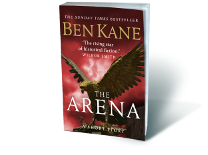 Available to buy in book stores and online now.